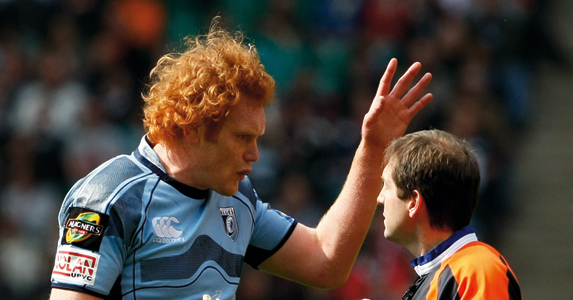 The Blues captain, famous for his flame red hair, took some time out to chat to Rugby World about nicknames, pre-match routines, strangling Jason Spice and being slightly fearful of life after rugby. RUGBY WORLD: So what are your captaincy traits? PAUL TITO: I just do what comes naturally. I don’t like to say too much and I share the workload, so a few of the other boys help out. The best form of leadership is delegation. RW: Does your nickname Fish come from being a good swimmer or New Zealand’s orange roughy fish? PT: The first time I meet people, I lead them on for a little bit and say it’s all because I’m a good swimmer. When I get to know them more, I tell them [about the fish]. You should feel privileged! PT: I spend a lot of time sleeping, then Jason Spice usually drives round to mine. A lot of the boys get there early, but I don’t like to be there any longer than I have to be. They play disco music in the changing room. When I first came over I was like, ‘Are we going to a nightclub or playing rugby?’ It took me a while to get used to, but I don’t mind it now. PT: Probably me strangling Jason Spice when Taranaki played Wellington in the NPC once! He’d been annoying me the whole game so near the end I strangled him and he went purple in the face. He’s an annoying guy on the field, but he’ll have a beer with you after the game. PT: I’m scared of life after rugby. I think about it every day. I’ve got a few ideas, but haven’t made any big decisions yet. I went straight into rugby so I’ve never had a real job or done a real day’s work, so it’ll be a shock to the system. PT: I’d like to be a good father one day. When I finish rugby, I’m also looking forward to getting into another sport. Squash I think; I back myself on a squash court so I’d like to take it up seriously. PT: My Taranaki rugby jersey from my 100th game, my wife, Hayley, and my flat-screen TV. It’s on the wall, but I think I’d have time to get it; I’d just yank it off. PT: I’d like to have Tongan-Samoan strength in terms of my rugby. They’re so strong. In life, unlimited money. Then you could do what you want all the time. PT: I don’t really have one. The biggest joke since I’ve been over here is the Welsh-Kiwi boat race. They make a big deal of it and have more players to pick from than us, but we kill them every time; it’s 3-0 to us. They blame each other, but are all quite average. Gethin Jenkins is in charge and he should look at himself before blaming anyone else. PT: Playing Waikato in the Ranfurly Shield, I was back covering a kick and the ball had a horrible bounce, I missed it and they scored. I was pretty gutted and there was a picture in the paper of me diving to try to get the ball. RW: Stranded on a desert island, what three things would you want with you? PT: I’d definitely need food – chicken and I love a good steak. I’ve also got a South African friend in Wales so I love a good braai, too. A pillow because I love my sleep. And I’d love to have my TV there. I like Home & Away and the early X Factor shows. A few of those people need their friends to tell them they can’t sing – I’ve been told that plenty of times. PT: Eva Longoria. I used to watch Desperate Housewives, but it’s on too late for me over here.